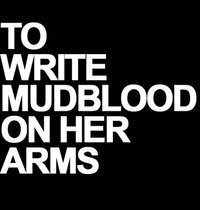 Mudblood. . Wallpaper and background images in the Harry Potter vs Twilight club tagged: series funny harry potter mudblood arms bellatrix. ...because she deserves it. DOWN WITH THE MUDBLOODS!